PLDT Home, the country’s No.1 home broadband, has finally launched the PLDT Home Prepaid WiFi, its first prepaid broadband service that makes it a lot easier for more families to get their own high-speed connection. It is powered by the country’s fastest LTE network. PLDT Home Prepaid WiFi is powered by Smart, the fastest LTE network in the Philippines. No less than Ookla, the global leader in internet testing and analysis, said Smart delivers the country’s fastest LTE connection with average download speeds of 17.25 Mbps, and average upload speeds of 7.65 Mbps, based on over 2 million user-generated tests. This means you can rely on PLDT Home Prepaid WiFi for all of your family’s online activities – from learning together and researching for school, bonding over streaming videos or music, to catching up with loved ones and friends on Facebook, Instagram or Twitter, or simply staying active your favorite apps. It is very affordable and easy on the pocket. The PLDT Home Prepaid Home WiFi is available at PLDT Stores and retailers nationwide, and comes with FREE 10GB valid for 7 days – all for a one-time payment of only Php1,995. FINTQ’s online lending platform Lendr also makes it easier for anyone to get hold of the device via affordable installment payments. With Lendr, you can buy the device for an initial low cash-out of Php495, followed by six weekly payments of Php370, which can be paid through any Smart Padala center, Bayad Center, ECPay, and 7-Eleven outlets. Simply visit https://pldthomewifi.lendr.com.ph to create an account, complete the application form and apply for a loan to purchase the device. It lets you enjoy PLDT’s pinakasulit Home Internet offer of 1GB for only Php15. Aside from being affordable, PLDT Home Prepaid WiFi also lets you enjoy PLDT Home’s pinakasulitHome Internet with Home Boost 15, which offers 1GB valid for 1 day, for only Php15. You can enjoy Home Boost 15 as an add-on to promos like Home Boost 50 or up, for greater savings. And because it’s prepaid, you don’t have to worry about monthly bills, contracts, or locked-in period. You simply load up the PLDT Home Prepaid WiFi and register to promos that suit your family’s online needs. It is specially designed for home use. Unlike the regular Pocket WiFi which is meant for users on the go, the PLDT Home Prepaid WiFi is specially designed for home use as it utilizes the LTE 700MHZ band, a low frequency that easily penetrates houses and buildings. This way, the PLDT Home Prepaid WiFi is able to deliver high-speed Internet indoors compared to the regular Pocket WiFi – whether in the living room, kitchen, or bedroom. The PLDT Home Prepaid WiFi is a plug and play device and practically anyone can set it up. Simply plug it to a power source to instantly connect up to 5 WiFi-ready devices, including your smartphone, tablet, and laptop. The device is also small and compact, and comes with a stand if you want to keep it upright, and hooks if you prefer mounting it on the wall. What are you waiting for? Get your own PLDT Home Prepaid WiFi now! 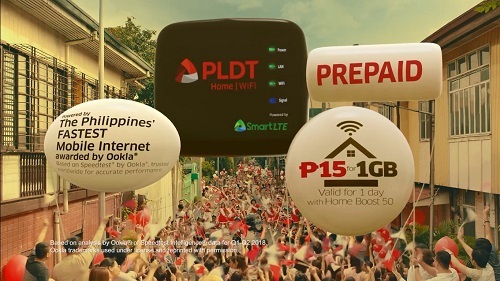 To know more, visit www.pldthome.com and follow PLDT’s official accounts on Facebook (www.facebook.com/PLDTHome) and Twitter (@PLDTHome).